Unsurprisingly, the New York Times recent website update had one sole purpose: to drive reader revenue. As a result, the site now contains a variety of features for a “streamlined and responsive” reader experience. Articles now can be read in one single scroll rather than having to click to the next page, comments run alongside the article you’re reading for a simultaneous view (see image below), and stories related to the article you’re on are suggested along the top of the screen. These features and more work towards enhancing the reader’s experience on their site and keep readers coming back. 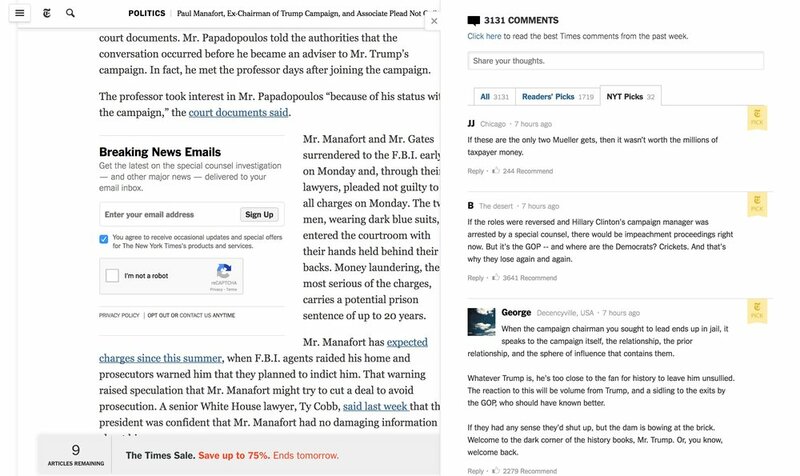 Personally, I think the leading aspect of New York Times new website is its overall look and feel of a tangible newspaper. Print may be dwindling, but the feeling of holding an actual publication to read the news should never die. According to SVP of product development at ESPN, the company “[...] really wanted to clean up the navigation and make it intuitive, easy to navigate, and consistent whatever screen you’re on.” The new website was redesigned to be hyper-responsive (particularly during the times of day when servers are packed with millions of users checking scores) and personal (the teams you’re interested in will be the stories featured at the top of your feed). Despite, these and other new features, ESPN's site looks less like an outdated MySpace page and more like modern social platforms, like Twitter for example. Much like the New York Times website redesign mentioned above, Chase Bank’s site update demonstrates the many industries that are moving away from paper and becoming more and more digital. Upon logging in, a user essentially sees a dashboard of their balance, recent transactions, and a few other important areas of information. They can also easily have access to an electronic version of their statements, banking summaries, and transfer/pay money online. This might sound routine, but having it all in one place and purposefully organized creates a convenience and seamless user experience. Chase’s website redesign has been accurately described as "Simple," "personal," "human" and "cohesive". As you can see, there are various areas of design that are influenced by branding - logos, packaging, and website are just a few crucial components. Thankfully, there are great examples out there from leading brands to look to for inspiration and direction.